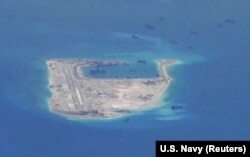 FILE - A Vietnamese floating guard station is seen on Truong Sa islands, or Spratly island. FILE - Chinese dredging vessels are purportedly seen around Fiery Cross Reef in the disputed Spratly Islands in the South China Sea in this image from video taken by a P-8A Poseidon surveillance aircraft provided by the U.S. Navy, May 21, 2015. Still, the country counts China as its top supplier of raw material for a fast-growing manufacturing sector. China is also Vietnam's top trading partner.